The US is collaborating with other imperialist countries to further tighten the economic blockade of Cuba; despite the opposition this is provoking in the region. On 25th October 2011, for the 20th consecutive time, the UN General Assembly voted 186-2 to end the blockade. The only country to support the US was Israel, which continues its own genocidal blockade of the Gaza strip. At the Bolivarian Alliance for the Latin Americas (ALBA) summit February 2012, a declaration was made against the blockade and Cuba's exclusion from the US-dominated OAS (Organisation of American States). When the OAS meeting came about in April, Rafael Correa of Ecuador boycotted the meeting in protest; leader after leader spoke out in opposition to the US veto of Cuba's presence. ALBA countries, and other leaders made it clear that without a radical change in the nature and structure of the summits, they would not attend again. Even arch-reactionary Pope Benedict XVI on his recent visit to Cuba criticised the: 'restrictive economic measures, imposed from outside the country' which 'unfairly burden the people.' With worldwide condemnation of imperialism's blockade, what does it mean for people on the ground in Cuba? The 'Justice for the Cuban 5' solidarity brigade visited Cuba this February, finding a country defiant and united in the face of this imperialist aggression. The brigade was able to see just how seriously the blockade affects the Cuban economy and its access to essential goods. This was something we came across everywhere, from schools and hospitals, to hotels and shops. The collective punishment imposed upon the entire nation for choosing socialism, and resisting imperialism is an ever present reality, and it is not forgotten by the people of Cuba. Jesus Garcia, a philosopher and delegate of the system of popular power, explained to us in no uncertain terms: 'All questions must take into account the fact that the US is at war with Cuba'. The blockade is just one aspect of US aggression against Cuba. When we visited a Committee for the Defence of the Revolution (CDR) – Cuba's 'smallest voluntary democratic unit' – in Havana Municipality, the members were clear that they must be ready to take up arms to defend themselves against imperialist invasion. The CDR system was founded on 28 September 1960 in response to escalating attacks from US backed counter-revolutionaries and imperialist aggression. That year the US passed the first few pieces of legislation establishing the blockade which was fully implemented by John F Kennedy on Feb. 3, 1962. Under the blockade, no US company or foreign subsidiary can trade with Cuba, and no product containing US made components can be sold to Cuba. No US bank can provide credit to Cuba, and now, third countries are being obstructed from this trade. There is constant international pressure from the US government, for example in 2008, under this pressure, Lloyds TSB demanded their customers to cease all financial connections with Cuba. In April 2012, Prensa Latina published new statistics detailing the cost of the blockade. They revealed that the government of the United States has confiscated more than $493 million from Cuba since 2010, and that the blockade has cost the country more than $975 million. The impact was evident in the institutions we visited. Drugs for medical use are seriously affected, as Dr Reiniel Amigo Gonzalez, Vice director of the Maternity Home ‘Leonor Perez’ in Old Havana, explained to us. Many drugs are unavailable in Cuba as US owned drug companies own the patents, and most other drugs cost three or four times more as they are imported from much further afield. At the Institute of Oncology and Radiology (INOR), Havana, the head of Paediatric Oncology, Dr Reno, explained to us how until 1990 the full impact of the blockade was offset by the Council for Mutual Economic Assistance, made up of the Soviet Union and the Eastern bloc. Following the collapse of the Soviet Union, Cuba experienced the 'special period'. GDP plummeted 35% overnight and Cuba lost 80% of its trade. In the ensuing 10 years, children’s healthcare deteriorated, with a rise in infant mortality, especially under 4's. Through innovation and creativity Socialist Cuba managed to turn this around: Forced to undertake constant research to develop their own drugs, Cuba's biotechnology and pharmaceutical industries have made incredible gains (Fight Racism! Fight Imperialism! 210 Aug/Sept 2009) Additionally the socialist movements developing in Latin America have presented new alliances and trade agreements that allow Cuba to defy the blockade. All Cuba's trade however, can be a target for the blockade, and even with new trading partners, the blockade still has a devastating effect. Dr Reno explained: 'now the US is further tightening the blockade and is systematically buying up companies which supply Cuba including EMORY, Dabur [an Indian Pharmaceutical company], plus others in Europe. These in particular affect access to medical equipment and surgical materials in Cuba.' At the institute, there was a shortage of most equipment and they told us 'we need anything and everything' – lumbar puncture needles was a particular issue. We passed long lines of people in the corridors, queuing for radiotherapy. With chronic shortages of basic equipment in many fields, queues like this are the responsibility of the blockade. So what of Barack Obama's supposed renewal of US-Cuban relations? It is just a front to hide the deepening attacks he is orchestrating. Manuel Montero of the Confederation of Cuban Workers (CTC), was clear on this point when we met him in Havana: 'Obama is operating behind the scenes, he says one thing about the blockade publicly but then behind the scenes they are increasing the blockade, an example of this is the sanctions being put on the Swiss bank for trading with Cuba. Barclays bank was recently fined. They are chasing any negotiations to try and increase the blockade.' With more people employed in the US chasing Cuban financial transactions than those gathering information about al-Qaeda, it is clear that the blockade is a high priority for US imperialism. Sanctions are continually threatened against those who trade with Cuba, and when this doesn't work, the US has resorted to buying majority stakes in these companies to change their policy. A recent example is the recently arrived Scarabeo 9 oil exploration rig, which had to be built with less that 10% US parts, brought all the way from Singapore, with at least 2 attempts to sabotage it. Similar US rigs sat unused in the Gulf of Mexico. The trade which the US does allow with Cuba is dictated entirely by US conditions. Some food and pharmaceuticals can be traded since legal changes in 2001. Surprisingly, the US is Cuba's seventh largest trade partner in 2010 according to Cuba's Office of National Statistics. These transactions however, must be paid for in cash up front– an unusual practice for trade agreements. Noel Carillo of the Central Committee of the Cuban Communist Party explained their political response to these changes. The decision was made to buy these products with cash to demonstrate the huge difference the blockade meant for the country. However the fact that the US demands Cuba pays cash in advance for all transactions has resulted in trade between Cuba dropping from $1 billion in 2008 to $410 million last year as Cuba turns to trade with other countries without such restrictions. As capitalism lurches further into crisis, struggling to keep its head above water, the tightening blockade of Cuba has two very clear objectives for imperialism: 1) To suffocate the world's only socialist state, a practical concrete example of the alternative to capitalist barbarism and the importance of Marxist-Leninist ideas; 2) Maintaining the possibility of crushing the revolution, thus opening up Cuba to a new influx of capital to briefly offset crisis. A 1960 US state department memo spells out the objectives of the blockade: 'to cause…disenchantment and disaffection based on economic dissatisfaction and hardship…weaken the economic life of Cuba…denying money and supplies to Cuba, to decrease monetary and real wages, to bring about hunger, desperation and overthrow of government.’ This plan is being carried out currently in Greece and Spain by the Eurozone crisis, it is the same plan inflicted by IMF policies and imperialist backed dictators in Egypt and Tunisia. 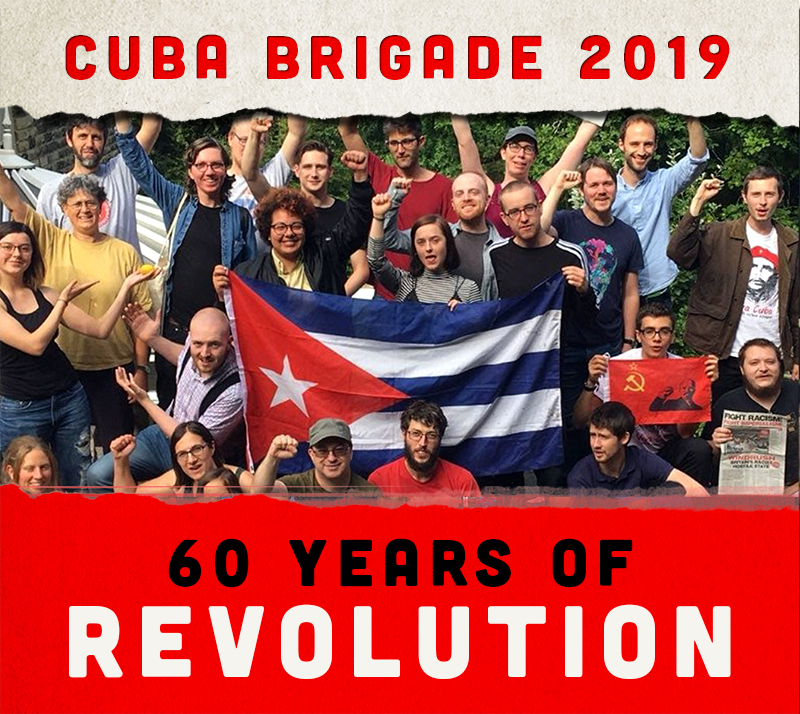 With ALBA rising in Latin America, and the horrors of capitalism being exposed around the globe, the people of Cuba will never stop resisting. The Cuban government, the national assembly and its system of popular power, cannot be overthrown, it is the government of the people. In the face of the blockade Cuba is positive and united, pushing for social progress within their country and around the world. As Dr Reno from the Oncological Institute put it: 'we are strong politically and we are glad that we are not alone...despite a limit on our resources, we help people everywhere'.